As we approach the end of another successful year of serving our customers, we wanted to take a moment to wish you all a Joyous Holiday and a Happy New Year. We'll be celebrating our 30th anniversary in 2014 and we have a lot of special offers and surprises in store for you. 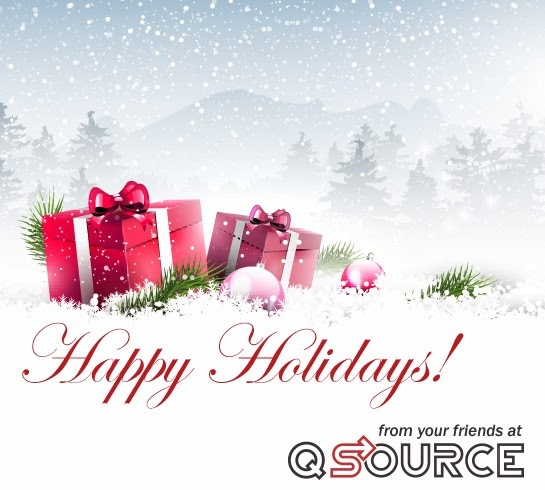 Please continue to visit QSource.com, The Q Source Resource Blog, and our social media accounts for news and special savings. Tuesday, December 24, 2013 – Open 8:30 a.m. – 1 p.m.
QSource.com is available 24 hours a day for product information or to place an order. Orders placed during office closures will be processed as soon as possible on the next business day. For further information please call (800-966-6020) or email us. Happy Holidays!